Last week Overstock.com (NASDAQ: OSTK) CEO Patrick M. Byrne ordered his paid internet stalker Judd Bagley to post an enemies list that included the "Facebook friends" of his critics on the DeepCapture.com web site, which has received both direct and indirect funding from the company and Byrne. As I will describe below, Overstock.com uses DeepCapture.com as a vehicle to viciously vilify and intimidate critics of the company and Patrick Byrne. Recently, the Securities and Exchange Commission started investigating Overstock.com's improper use of "cookie jar" reserves to inflate the company's financial performance starting in Q4 2008 as well as other financial reporting violations, as a result of reporting in this blog. I urge you to also investigate Overstock.com's vicious corporate sponsored retaliation and intimidation campaign against company critics such as myself. Overstock.com's Board of Directors have breached their fiduciary duty to investors by failing to act on violations of the company's Code of Business Conduct and Ethics by Patrick Byrne and others acting at his direction. Therefore, Patrick Byrne was given an implicit waiver from the company's code of ethics which was not reported as required on form 8-K.
Judd Bagley violated Facebook's Statement of Rights and Responsibilities and deceptively posed as "Larry Bergman" in an effort to gather personal information and spy on Patrick Byrne's critics, including me (See Item 3 Safety and Item 4 Registration and Security). Altogether, Judd Bagley posted on DeepCapture.com the names of 7,483 "Facebook friends" of Patrick Byrne's critics and that list included spouses, minor children, and other people that have nothing to do with Overstock.com, Patrick Byrne, or Byrne's delusional short selling conspiracy theories. Judd Bagley, posing as an imposter, even tried to "Facebook friend" minor children! 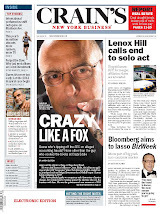 Note: For additional details, please read Gary Weiss blog, Tracy Coenen's Fraud Files blog, Joe Weisenthal's Business Insider blog, Felix Salmon's Reuters blog, and Barry Ritholtz's The Big Picture blog. For example, below is an exchange between Bagley and I that was posted in the comments section of Joe Weisenthal's Business Insider blog. "The Deep Capture website was created to bypass the 'captured' institutions that mediate our nation’s discourse. It was initially funded by Patrick Byrne, CEO of Overstock.com, but it is not part of Overstock. It functions as a separate, limited liability media company, whose co-owners and managers are Judd Bagley, Evren Karpak, and Mark Mitchell." 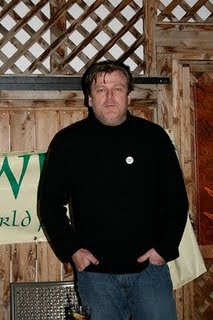 Your website states that Patrick Byrne provided the initial funding for Deep Capture, but it claims that there is no connection between the Overstock.com and Deep Capture. Yet, Patrick Byrne recently made two blogs posts on Deep Capture and published my emails to him asking to participate in Overstock.com’s recent November 3 and 18 conference calls to ask critical questions about financial reporting violations by the company. What does the subject of my participation in Overstock.com’s November 3 and 18 conference calls to ask questions about the subject of GAAP and SEC disclosure violations by Overstock.com have to do with Deep Capture’s editorial policy? Is it your contention that money from Patrick Byrne and/or entities controlled by him are not the source of the salary that you and your fellow employees of Deep Capture receive? If not, who is the source of that funding? "DeepCapture investigative reporter Judd Bagley used an assumed name to infiltrate their Facebook network...."
What's even more disgusting is the fact that Bagley tried to FB friend my children, too. Bagley succeeded in becoming Facebook friends with other friends of mine that have nothing to do with issues concerning Overstock.com, short selling, hedge funds, etc. Hey Sam, your "kids" are like 30 years old. Time to cut the apron strings, don't you think. My children are actually in their 20s. As their father, I unconditionally love them and will protect them from you, Patrick Byrne, and others no matter what their ages are. In addition, you also posted the names of my minor nieces and nephews on your enemies list. What do my minor nieces and nephews have anything to do with Overstock.com, hedge funds, naked short selling etc? You attempted to interfere with my matrimonial litigation by threatening me to settle it. You even contacted by ex-spouse. According to her, she rebuffed you. You used your false Larry Bergman Facebook identity to invade the privacy of other Facebook friends of mine who have nothing to do Overstock.com, hedge funds, naked short selling etc. So please stop your charade. You are fooling no one, except your cool aid drinkers. 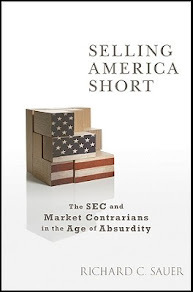 As you know, Overstock.com, Patrick Byrne, and its other officers are under investigation by the Securities and Exchange Commission, as a result of my reporting GAAP and other SEC disclosure violations by the company to the SEC. Overstock.com CEO Patrick Byrne provided the initial funding for Deep Capture LLC and you are a managing partner of that entity. Your complicity with Patrick Byrne in retaliating against a whistleblower makes you a willing participant in helping Overstock.com defraud investors by trying to intimidate me into silence about the false and misleading financial disclosures by Overstock.com and its management. Somehow, you don’t seem to care about the legal risk you have brought upon yourself. In any case, I refuse to back down from exposing GAAP and SEC disclosure violations by Overstock.com and its management team and I will not be intimidated into silence by paid stalkers like you. After broad condemnation by other bloggers, Patrick Byrne trimmed down his enemies list to 1,689 names. However, the name of my oldest son still remains on that list (as of this posting). The Deep Capture website was created to bypass the “captured” institutions that mediate our nation’s discourse. It was initially funded by Patrick Byrne, CEO of Overstock.com, but it is not part of Overstock. It functions as a separate, limited liability media company, whose co-owners and managers are Judd Bagley, Evren Karpak, and Mark Mitchell. Both Bagley and Karpak are so-called former Overstock.com employees. Mark Mitchell is a washed up former Columbia Journalism Review reporter who left CJR after his lapses of their journalistic ethics. Overstock.com's web site heavily promotes DeepCapture.com, Patrick Byrne claims to be a "journalist" working for Deep Capture, and Deep Capture receives commissions from customers who purchase merchandise from Overstock.com through referrals from its website to the company. On October 31, I sent Patrick Byrne an email and asked to participate in Overstock.com’s Q3 2009 earnings call, so I could ask questions about Overstock.com's violations of GAAP and other SEC disclosure rules. In response, Patrick Byrne responded with an angry anti-Semitic diatribe, called me a “gonif” (Hebrew/Yiddish word for thief), and posted my email on his Deep Capture blog, despite previous claims that Deep Capture is unrelated to Overstock.com (See Gary Weiss blog for more details). On November 18, I sent Patrick Byrne another email asking to participate in Overstock.com's Q3 2009 conference call where it was going to discuss its filing of an "unreviewed" 10-Q. Again, Byrne posted my email on his Deep Capture blog and again referred to me as a "gonif." If Deep Capture is "not part of Overstock" as it claims, why did Patrick Byrne post my emails asking to participate in various Overstock.com conference calls and personally attack me with anti-Semitic slurs? 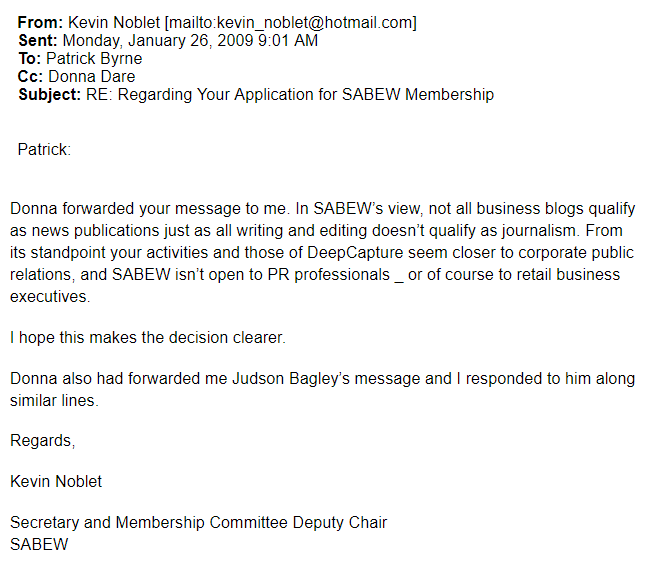 Judd Bagley has refused to answer my emailed questions (cc'd to the SEC) asking him as a "Managing Partner" whether or not and he or others approve Patrick Byrne's blog posts prior to publication on DeepCapture.com. 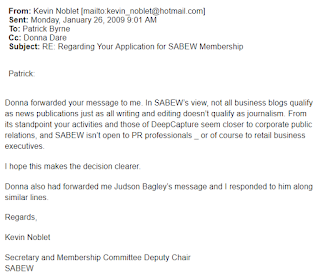 In addition, Judd Bagley has refused to answer questions about whether or not Deep Capture has a "conflict of interest" policy and if he approves of Patrick Byrne calling his critics, who happen to be Jewish like me and Gary Weiss, "gonifs." Why is Judd Bagley so afraid to answer such questions about Patrick Byrne's activities at Deep Capture? Apparently, Judd Bagley does not want to answer any questions because it is not in his interests or the interests of his real employers, Overstock.com and Patrick Byrne. In 2007, Judd Bagley colluded with his trusted friend Edward Manfredonia to spread vile anti-Semitic trash talk (download) about Conde Nast contributing editor Gary Weiss and I on his antisocialmedia.net blog. Manfredonia once wrote the International Herald Tribune, “Don’t judge the Nazi’s too harshly.” He has sued Gary Weiss, the Securities and Exchange Commission, and Yahoo claiming among other things delusional criminal conspiracies singling out Jews, in particular. All of those cases were thrown out of court. Later that year, Patrick Byrne even bribed Utah Attorney General Mark Shurtleff to write a letter (issued as a press release and still posted on Overstock.com’s web site) defaming me by claiming that I made certain agreements that I never made with Shurtleff's office. I went to Utah at my own expense and took no fees to train Shurtleff’s staff on combating white collar crime. However, taped transcripts of phone conversations with Chief Deputy Attorney General Kirk Torgensen and Deputy Attorney General Richard Hamp revealed Byrne’s scheme with Shurtleff to defame and discredit me (Details here). In April 2009, Judd Bagley threatened me to settle my matrimonial litigation with my ex-spouse and told me to, "settle the suit...give her whatever she wants. Because if it goes to trial, I'll probably attend." Every initial financial report issued by Overstock.com for every reporting period since the company's inception has violated Generally Accepted Accounting Principles (GAAP) and SEC disclosure rules. The company has restated its financial reports two times in the last three years due to such GAAP and SEC disclosure violations and is now desperately trying to avoid a third restatement of its financial reports. The SEC started investigating Overstock.com after I alerted them to new GAAP violations by the company. Afterwards, Overstock.com fired Grant Thornton as the company's auditors and publicly vilified them when they recommended another restatement of the company's financial reports, just as I previously called for in my blog. The company filed an "unreviewed" Q3 2009 10-Q and CEO Patrick Byrne and CFO Steve Chesnut did not sign required Sarbanes-Oxley certifications. NASDAQ sent Overstock.com a letter warning the company of a possible de-listing. Here you have a clear case of scienter for a rule 10b-5 violation based on Overstock.com’s unwillingness to restate its financial reports and instead retaliate against its critics by such as myself. Your failure to act on blatant issuer retaliation by Overstock.com will encourage even more dishonest companies to retaliate against their critics and result in significant losses to investors. Overstock.com's enemies list containing 1,689 names which still includes my oldest son's name.